The Waikato River Trails follow New Zealand’s longest river, through native bush, exotic forest and remote farmland. Trek over boardwalks, streams and suspension bridges. The Waikato River Trails follow New Zealand’s longest river, through diverse native bush, forest and remote farmland. Trek over boardwalks, streams and suspension bridges. The trails cover roughly 103 kilometres of previously inaccessible Southern Waikato land. They wind their way along a path that encompasses the magic and beauty of New Zealand native bush and exotic forest. View the geological delights of historic landmarks and interesting rock formations. Be inspired as you walk, run or cycle through grassed farmland and open reserves. Amble over boardwalks above the wetlands, and take in expansive lake and river views. 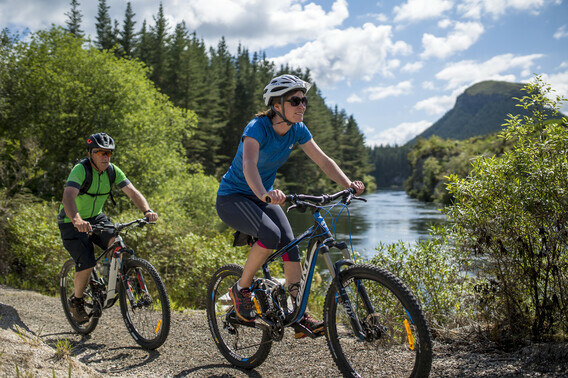 As a member of the New Zealand Cycle Trails network, the Waikato River Trails are a fascinating, adventurous ride showcasing New Zealand’s longest river, the Mighty Waikato. A multi purpose trail ideal for mountain biking, walking and running, the trails provide access to areas previously seen by only a few. The trails are ridable all year round, however an extra layer or two will be required in the winter months. The ride can best be described as a crescendo of sights amongst beautiful landscapes. Around each corner you will experience something new. The villages along the way provide accommodation and cafes with the best of heartland hospitality. If you want to enjoy and make the most of your time along the Trails you need to be prepared. If you and your group have a low to moderate fitness level and haven’t done much biking in the last year for two, then we suggest that you allow an extra day to break up the advanced sections within our Trail. You can arrange your own trip – or there are helpful Trail operators who can organise a trip that will suit you. Below are some popular itineraries to consider. A four day journey that allows you plenty of time to travel at a relaxed pace. Walking the Waikato River Trails is one way to connect with nature all year round, in previously inaccessible Southern Waikato land. Be captivated by breath-taking scenery and the feeling of being one with nature. Be inspired as you walk through grassed farmland and open reserves. Hike over boardwalks above significant wetlands, and enjoy expansive lake and river views. Whether it is to be a bonding time between parent and child, spending time with your partner or as part of a group excursion – take the journey, live the experience, no regrets. A three day trip sampling only the intermediate sections of the trail. A three day trip taking on the whole trail.